During Grandma Hollywood's recent visit to oh-Alison-it's-too-cold-here Ohio, I spent a morning with her and my two minis. The nearly 90 years between them brought forth a range of encounters, some endearing, some frustrating, and some just plain hysterical. For starters, my kids don't perceive age. They see Grandma Hollywood's thin coarse white hair and say, "Great Grams' hair is funny." Nor do they perceive the limitations that come with age. They expect her to scoop them up to her level, and bless her still beating heart, she tries. And it breaks mine to watch her disappointment when she realizes that her ability to lift a small child is forever in her past. My spunky and gregarious daughter is unaware that when she barrels into Grandma Hollywood's 90 year old legs, she risks knocking my grandmother to the floor, a fall from which Grandma literally might not recover. And yet Grandma Hollywood lives as if the life-threatening fall would be worth it. When Miss Harper Lynn looked at her and said, "Chase me, Great Grams," Grandma Hollywood looked at me and said, "What did she say?" I responded, "She wants you to chase her." Grandma only grinned, and sure enough, she started her feeble chase, a snail's pace behind my hare of a daughter. And my 2 year old baby girl only knew one thing, she was being chased. The burst of squeals and giggles that ensued were as dramatic and effervescent as if the chase might actually result in a catch. As I sat with my grandmother listening to her repeat the stories I had heard dozens of times before, I juggled my annoyance of her faulty memory with the constant needs of my kids, "I need to poop! I need to poop! I keep tooting and I need to poop!" No matter how high her hearing aids were turned up, Grandma Hollywood needed clarification on almost everything the kids said, "What is he talking about, Alison?" Well, Grandma, do you really want to know? 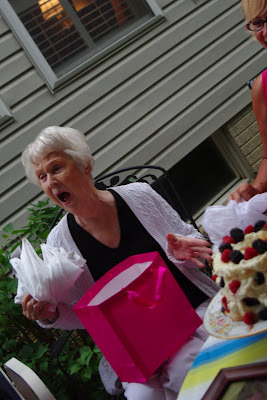 Though I'd love for you to believe that each exchange between my grandmother and children results in pure joy and laughter, there is much harmony to be desired. Typical of most three year old boys, my son sees pillows and immediately thinks fort. As he pulled the decorative pillows from the couch, Grandma Hollywood became intensely concerned. "Alison, do you see what he's doing?" Me: "Yes, he's fine, Grandma." Grandma Hollywood: "But he's pulled all of the pillows off of the couch." Me: "I know Grandma; he's just playing." Grandma Hollywood walked away in obvious disapproval of my son's creativity and my kids-these-days parenting. And typical of most three year old boys, it was a mere five minutes before Henry was distracted, leaving the pillow fort glaring at my grandmother. She wasted no time. I've never seen feeble bones move so fast. In record time, she had each of those pillows fluffed and positioned back on the couch ready for a magazine cover shoot, thankyouverymuch. There wasn't much to say when my son ran back into the room and blurted, "What happened to my fort?!" I took one look at my now-playing-dumb grandmother and turned back to my son, saying what every good granddaughter would say, "Go play." As I sat across from my 90 year old grandmother, a woman whose grace has deteriorated while her opinions have intensified, I wonder if she remembers the days when her four children were small, imaginative bursts of energy. "Alison, Henry didn't finish his lunch." "Alison, what is that noise?" "Alison, where did Harper go?" "Alison, don't your children wear socks?" "Alison, Henry went into the bathroom." "Alison, Harper is climbing on the table." Alison. Alison. Alison. The thoughts swirling in my mind were not of a very good granddaughter. The sweet and gentle Mrs. Claus of a grandmother who I remember has evolved into a nosey, nagging, negative Nancy. And yet as I gather my minis to say goodbye to the woman who still travels solo 2000+ miles from California to spend time with us, she clasps her thin-skinned hands around my face and directs her macular degenerated eyes directly into mine. With pure sincerity and warmth, she says to me, "Alison, I love you and your family so so much." She doesn't let go. She stays there for what seems like minutes. And I begin to melt, remembering only a fraction of what she has survived in a near century: the loss of a twin and mother during birth, the horrors of a wicked stepmother, the passing of a spouse, and the sudden death of a child. And it's no surprise that within minutes of her departure, I long for her company once again, kicking myself for the moments squandered because of my irritability and impatience. The distance now between us truly does cause my heart to swell, and I become saddened as I think of her now home alone, her only companion the chiming clock that strikes every 15 minutes, a sobering reminder of the minutes passing, her memory fading, her brain diminishing, and her body failing. Thank you, Jesus, for Grandma Hollywood. Wrap her in Your comfort and peace as she suffers the countless losses that come with her age. Help me to remember the blessing it is to still have a living grandparent. And give me patience and a controlled tongue in those moments when I want to load her back on a plane destined for California.